Diversity is silver’s primary benefit to the precious metal investor. It is estimated that more than 95% of the world’s silver has already been mined and consumed. Though its rapidly depleting supply makes it relatively scarce, silver remains the most abundant and inexpensive precious metal. In addition to being used as a medium of exchange, silver has been used to create jewelry, religious artifacts, plates, cups, vases, eating utensils and other vessels. In addition to it monetary and bartering uses, silver’s unique characteristics make it a valuable industrial commodity. Unlike gold, which is primarily purchased as a store of value, silver is most often purchased for its industrial uses. Adding to its diversity, this precious metal is also used in many health care products due to its antibacterial characteristics. With its limited supply and multiple sources of demand, silver is becoming increasingly popular to investors. As mentioned above, silver is becoming increasingly popular as an investment. It has monetary uses, industrial uses and even characteristics that make it valuable in the ever growing health care industry. It even has a lower price point that makes it accessible to investors of all wealth levels! Choices of investment vehicle for this precious metal range from silver certificates, silver accounts and silver bullion. Other investment options include ETF’s, silver mining stocks, and silver futures contracts. It is important to remember that this discussion focuses on one silver investment vehicle, the purchase of physical silver. The physical silver market provides investors a variety of products. The choice of silver bullion product is largely a matter of the investor’s goals and resources. Particular silver investment products serve primarily as a store of value while others serve both as a store of value and could be used as money to be spent should barter become necessary as many people fear. Varying “premiums” (which include dealer premiums and commissions, all shipping costs and insurance) and IRA regulations are also important to consider when deciding between the different vehicles. Currently, the U.S. Internal Revenue Service (IRS) allows silver be included in a self directed IRA if certain rules are followed. One of the most popular ways to invest in silver is the 90% U.S. “bag” of junk silver. The word “junk” refers only to the value of the coins as a bullion investment and not to the actual condition of the coins. These bags contain coins with a 90% silver composition (“coin silver”) and consist of U.S. dimes, quarters, and half-dollars dated 1964 or earlier. Each bag contains approximately 715 troy ounces of actual silver with a face value of $1000. Bags can be purchased in the following sizes: one-quarter, one-half, three quarters or full bag of silver. An investor should expect to pay a $.75 to $1.75 per ounce “premium” (which includes dealer premiums and commissions, all shipping costs and insurance) over the spot price of silver. Generally, an additional per ounce “premium” is levied for half-dollars over dimes or quarters due to the higher silver content, consumer preferences and the fact that fewer half-dollars were minted than dimes or quarters. This additional per ounce “premium” varies depending on market conditions. There are several advantages when acquiring junk bags of silver. Firstly, the bag carries a low per ounce “premium” (which includes dealer premiums and commissions, all shipping costs and insurance) over spot price when compared to other silver investments. Secondly, junk silver was produced by the U.S. government and is U.S. legal tender. Thirdly, junk silver is internationally recognized as a trading medium and therefore, highly liquid. Additionally, junk silver is divisible, providing small increments when used for exchange. Bags of junk silver are NOT currently allowed in self directed IRA’s. For purposes of barter, NNA recommends dimes or quarters. Depending upon the source, a “silver round” can de defined in numerous ways. Here, I use the term “silver round” when referring to any one ounce silver bullion coin that contains .999 (99.9%) fine silver. Privately-minted Silver Rounds are an inexpensive and convenient way to own silver. They are popular because of their varying appearances and low relative per ounce “premiums” (which include dealer premiums and commissions, all shipping costs and insurance). They are called “privately-minted” because they are manufactured by a private mint (i.e. Johnson Matthay, Engelhard, Credit Suisse and many other recognized smaller mints). 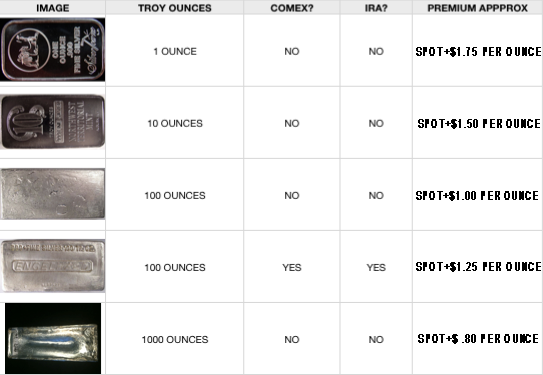 Including a per ounce “premium” (which includes dealer premiums and commissions, all shipping costs and insurance), prices are generally $2.10 to $2.75 over the spot price of silver. While per ounce “premiums” (which include dealer premiums and commissions, all shipping costs and insurance) vary depending on the particular mint and market demand, privately minted silver rounds have their weight and purity (999 fine) stamped on them, making them easy to identify and to sell or exchange. Currently, I consider these coins to be the best buy if desiring your investment to serve as both a store of value (a purely “investment medium”) and a medium of exchange (as “money”). Privately minted silver rounds are not considered legal tender and vary in design. Privately minted silver rounds are NOT currently allowed in self directed IRA’s. Many countries — including the United States, Canada, and Austria mint official legal tender silver coins with .999 purity. The Silver American Eagle, Canadian Maple Leaf and Austrian Philharmonic are all one-ounce silver coins. When compared to privately minted coins, they do carry a higher per ounce “premium” (which includes dealer premiums and commissions, all shipping costs and insurance) since they are issued by governments. Currently the Silver American Eagle has a per ounce “premium” (which includes dealer premiums and commissions, all shipping costs and insurance) of approximately $3.25 to $3.75 over the silver spot price. Normally, both the Canadian Silver Maple Leafs and the Austrian Philharmonic are priced below the American Silver Eagles but higher than the privately minted Silver Rounds. When choosing government minted coins, it is important to consider both the higher per ounce “premium” (which includes dealer premiums and commissions, all shipping costs and insurance) when purchasing and the fact that these government issued coins lose a little more of their per ounce “premium” (which includes dealer premiums and commissions, all shipping costs and insurance), when compared to other forms of physical silver upon liquidation. Many investors prefer these coins due to the fact that they are globally recognized as a form of legal tender and ARE currently allowed in self directed (U.S.) IRA’s. In 2010, the United States Mint began to issue 56 quarter-dollar coins featuring designs depicting national parks and other national sites as part of the United States Mint America the Beautiful Quarters® Program. 2011 marks the second year of the program and features the next 5 quarters. The United States Mint will also mint and issue unique silver bullion coins that are exact duplicates of each of the America the Beautiful Quarters. The bullion coins will be made of .999 fine silver, have a diameter of three inches and weigh five ounces. Silver bars are available in numerous sizes ranging from one ounce to over 1,000 ounces and are issued by major refiners. When only considering silver as an investment medium, rather than one with exchange potential, these bars provide an excellent store of value. Similarly to gold bullion, silver bars can be held within a fungible program and the investor is never required to take possession of this heavy metal. The per ounce “premium” (which includes dealer premiums and commissions, all shipping costs and insurance) is relatively low and ranges from $.90 to $1.50 over the silver spot price. Silver bars with recognized hallmarks are preferred as they are more readily accepted for resale, making them more liquid. Additionally, they (depending on the refiner) are currently allowed in self directed (U.S.) IRA’s. ¹”Slabbed” coins are not permissible. ²Gold, Silver, Platinum, & Palladium bars must be fabricated by NYMEX or COMEX approved refiners or national government mint. This is one of the areas where people have the most number of questions. Of course, this information can change at any time. We are not an accounting firm, registered accountants, attorneys, or tax experts. This information is intended to assist you and is not intended to be used as sole guidance for complying with these regulations. You should always contact your accountant, CPA or attorney with any tax questions, issues or concerns. The only reporting requirement when purchasing Precious Metals currently involves cash and money orders. You can purchase up to a maximum of $9999 in cash or money order without having to fill out the form 8300 to report the transaction to the IRS. If you write a personal check or wire funds there are no reporting requirements regardless of your purchase size. The reporting requirements on the selling side are more complicated. This is where the 1099-B form may apply when liquidating certain items. The question involves the type and quantity of product that you are liquidating. I will give a brief summary of reportable and non-reportable silver products and quantities. The following require a 1099-B to be issued when you sell the listed coins or bars in the quantities listed by the end of the calendar year. A combination of these coins that together go above the limits also count for reporting purposes. For example, if you were to liquidate 700 ounces of silver bars and 300 ounces of silver rounds in one calendar year, you would be be required to report this transaction. There are many more silver products that fall into this category. However, these are the most popular ones. All of these silver products are non-reportable regardless of the quantity sold.